The downright simple system I use to create content consistently for my blogs! TweetShare26Pin14Share40 Shares I run not one, but many online businesses. And that means, separate websites (and blogs) for all of them – to set the online space and branding for my businesses. This in turn means, creating a lot of content! That’s not as easy as it sounds. 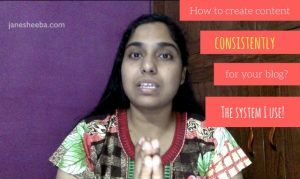 If you have been blogging for a … Continue reading How to create content for your blog(s) consistently? Here’s the system I use!